Can you believe that Thanksgiving is just a week away! The month of November has literally flown by! 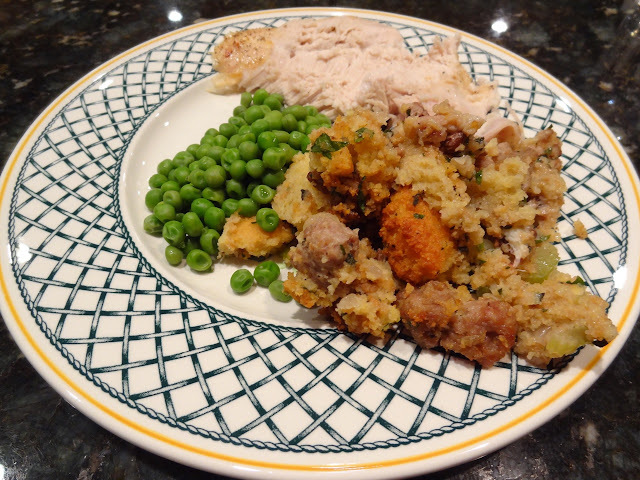 My mom’s corn bread stuffing recipe has been in the family for years. We make it every Thanksgiving, until now??? My mom and I received the latest Bon Appetit magazine in the mail. 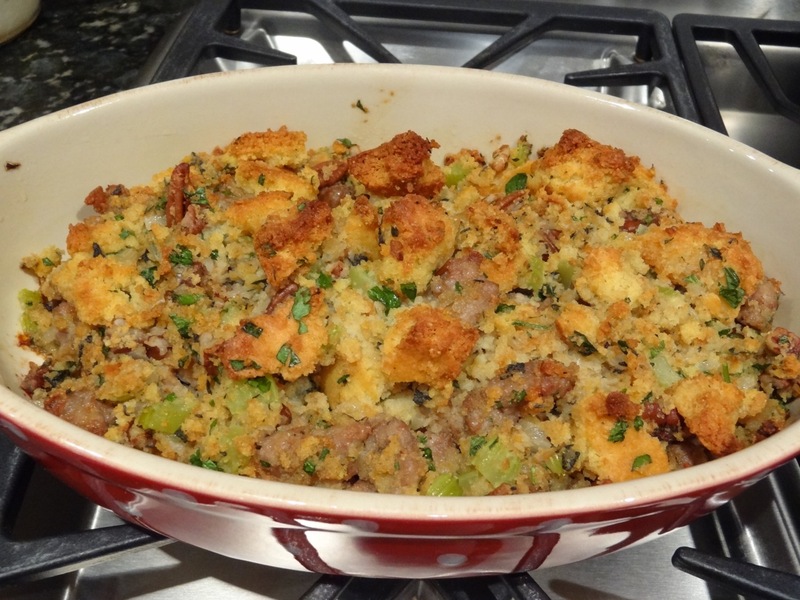 Inside the issue, quite a few stuffing recipes were boldly featured. We couldn’t wait for Thanksgiving and decided to give this Cornbread, Sausage and Pecan Stuffing recipe a try! What did we think? It was great! The sausage was a great addition as it turns up the volume in this side dish and adds quite a bit of protein. Unfortunately the sausage also adds quite a bit of fat. I recommend buying turkey sausage, the leaner version of pork sausage. It will cut the fat in half, at least! So, what’s the verdict? 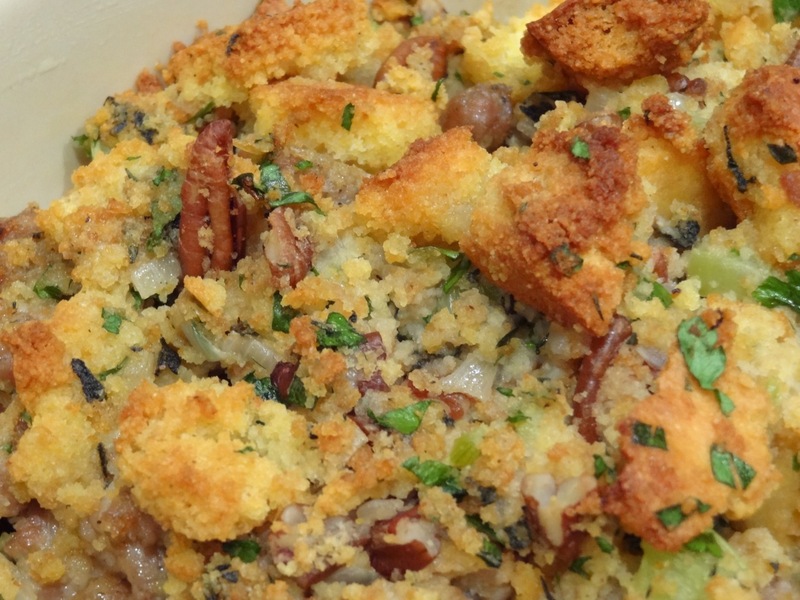 Will we make our traditional cornbread stuffing or this new one from Bon Appetit? Drumroll please………………. 1. Arrange racks in upper and lower thirds of oven; preheat to 250 degrees F. Butter a 13x9x2-inch baking dish; set aside. 2. Scatter cornbread in a single layer on 2 rimmed baking sheets. Bake, stirring often and rotating sheets halfway through, until dried out, about 1 hour. Let cool. Transfer to a very large mixing bowl. 3. Meanwhile, cook sausage in a large skillet over medium-high heat, breaking up into 1/2-inch – 1-inch pieces with a wooden spoon, until browned, 8-10 minutes. Transfer to bowl with cornbread but do not stir. 4. Heat 3/4 cup butter in same skillet; add onions and celery and cook, stirring often, until softened and just beginning to brown, about 10 minutes. Add to cornbread in bowl. 5. Return skillet to heat. Add vinegar, cook, scraping up browned bits from bottom of pan, for 1 minute. Pour into bowl with cornbread. Gently fold in 1 1/2 cups broth, pecans, if using, parsley, sage, rosemary, and thyme. Add salt and pepper. Let cool. 6. Preheat oven to 350 degrees F. Whisk 1 1/2 cups broth and eggs in a small bowl. Fold gently into cornbread until thoroughly combined, taking care not to mash cornbread (mixture will look wet). Transfer to prepared dish, cover with foil, and bake until an instant-read thermometer inserted into the center of dressing registers 160 degrees F, about 40 minutes.